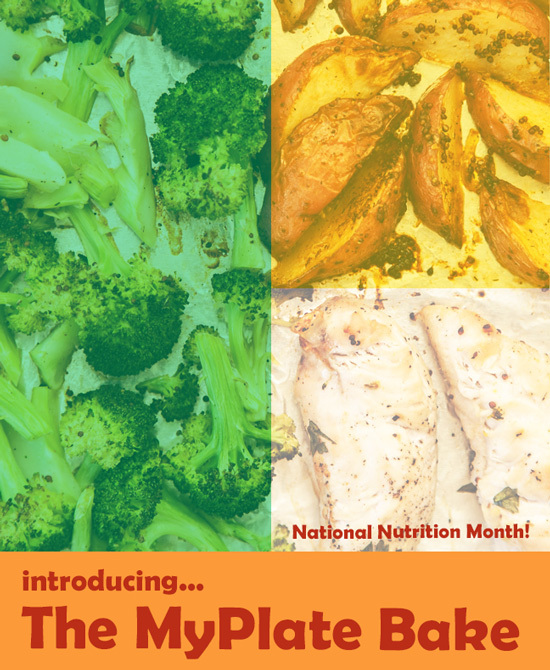 March is National Nutrition Month, and it’s prime time for talking up my favorite subject: healthy food, and how to enjoy it! 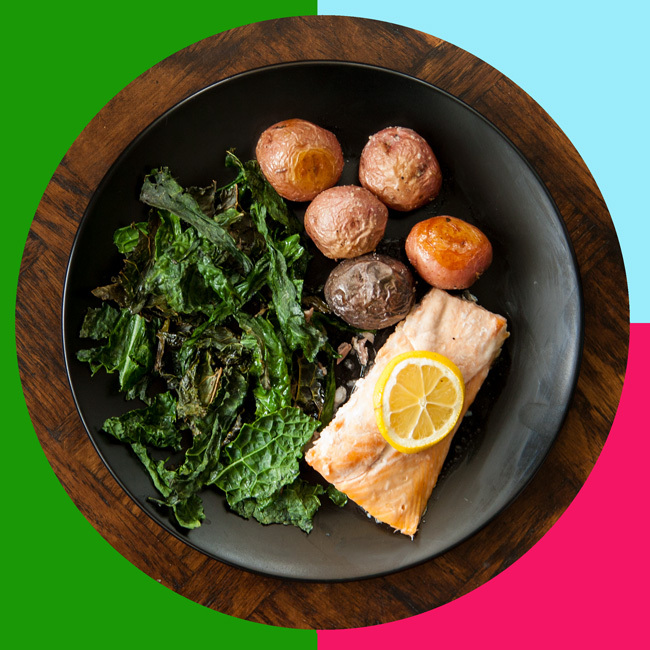 This year’s theme is “Bite into a Healthy Lifestyle,” and I’m celebrating by biting into an exciting new series of recipes inspired by USDA’s MyPlate. I’m a big fan of the simplicity of this food icon, designed to make it easy to build a healthier diet, one plate at a time. 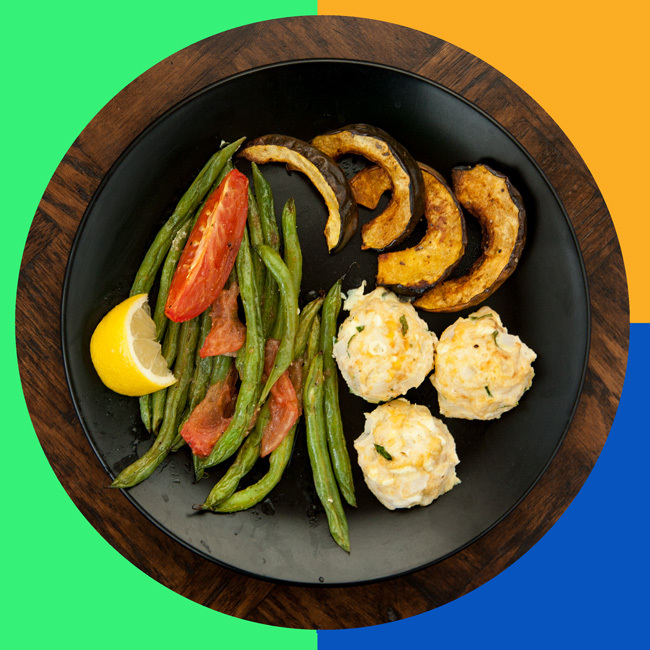 If you ask me, striving to make your plates look more like MyPlate (with half of the real estate covered by fruits and veggies) is one of the most straightforward ways to shift your eating habits to become healthier than ever. For this recipe series, I’m calling my invention the MyPlate Bake. The concept is to follow the MyPlate formula of 1/2 veggies + 1/4 carbs + 1/4 protein, and roast it all together on a single sheet pan. This results in a healthy home-cooked dinner for two, made from scratch with whole food ingredients, in under an hour (prep and clean-up included). Believe it! I’ll be updating the blog every week this month with a tasty new variation, so stay tuned! First up is an instant classic that I already know will be a go-to in my kitchen: the Maple Dijon Chicken MyPlate Bake. 1. 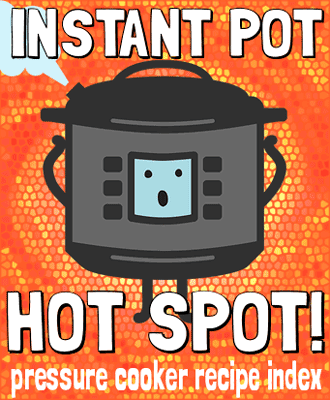 Preheat your oven to 400 F and collect your ingredients. Line a sheet pan with aluminum foil for easy cleanup, and take out your favorite medium-sized bowl that you’ll use to toss the ingredients with their seasonings. 2. Slice a couple of potatoes into wedges, and toss them into the bowl with olive oil, grainy mustard, maple syrup, and the other seasonings listed in the full recipe below. No need to measure – just eyeball everything! Arrange the potato slices into a single layer in 1/4 of the sheet pan, and put them into the oven to start cooking while you prep the other food. Set a timer for 20 minutes. 3. While the potatoes start roasting, chop a head of broccoli and toss it in the same bowl you used for the potatoes. If there isn’t enough excess olive oil in the bowl already, add another drizzle and some salt and pepper for good measure. 4. 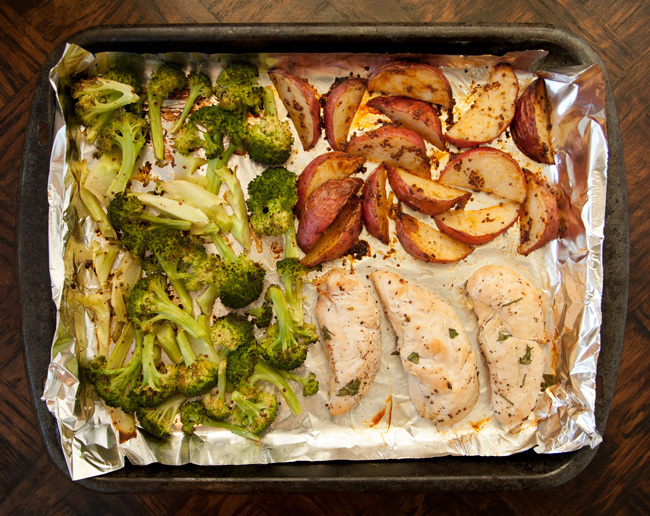 Your timer for the potatoes will probably be going off pretty soon – when it does, pull out the sheet pan and distribute the broccoli over half of the surface. 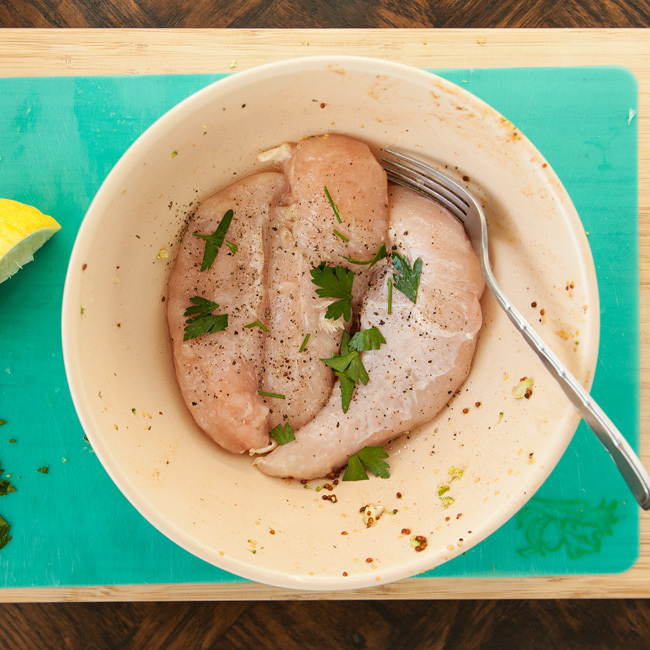 Then use your bowl one last time to toss together your chicken breasts with lemon juice, fresh herbs, and some more salt + pepper. I used breast tenderloins because they were on sale this week, but full size boneless breasts are totally fine too. Place the chicken pieces onto the remaining quarter of the sheet pan, and put it all back into the hot oven. Set another timer for 20 minutes. 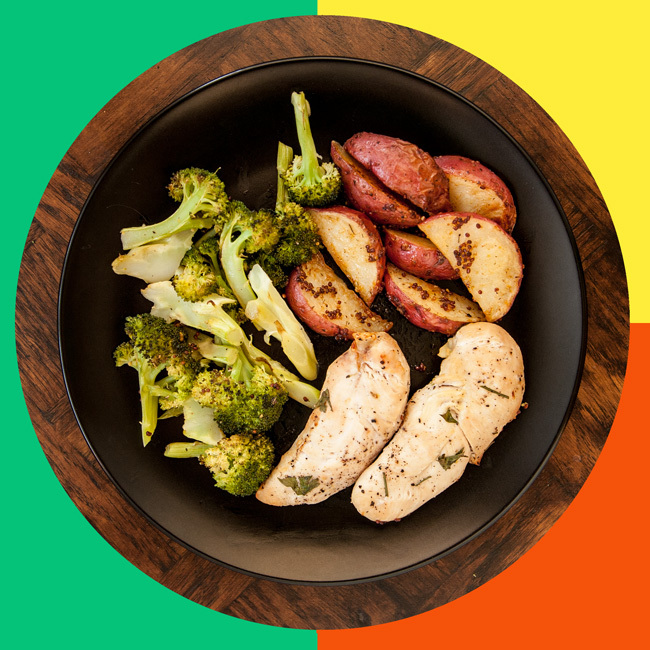 Putting a balanced meal on the table doesn’t get much simpler than this! And by swapping out your choice of protein + carb + veggie + seasonings, it’s infinitely adaptable. 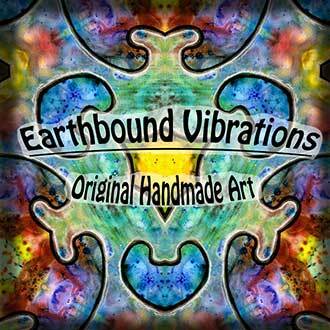 That’s why this month is dedicated to posting a new variation on this method every week! 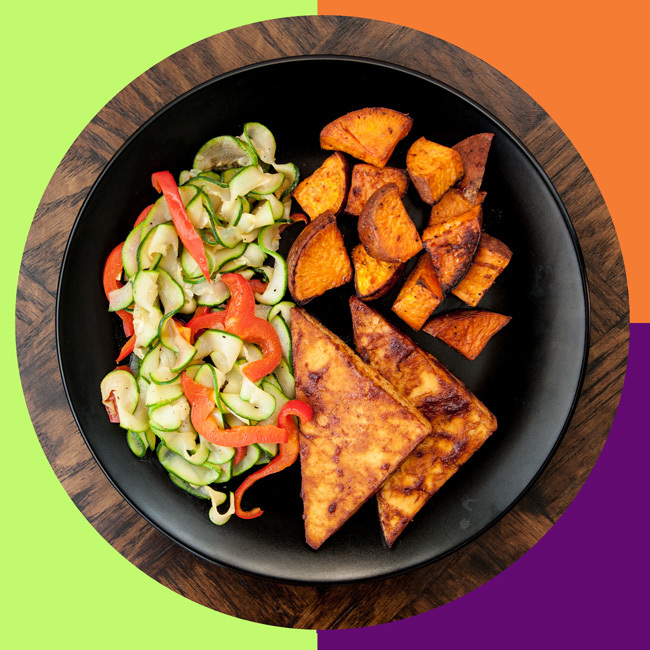 So be sure to check back for more easy/healthy/delicious dinners to add to your weeknight rotation! Wash the potatoes and slice them into roughly 1-inch chunks or wedges. 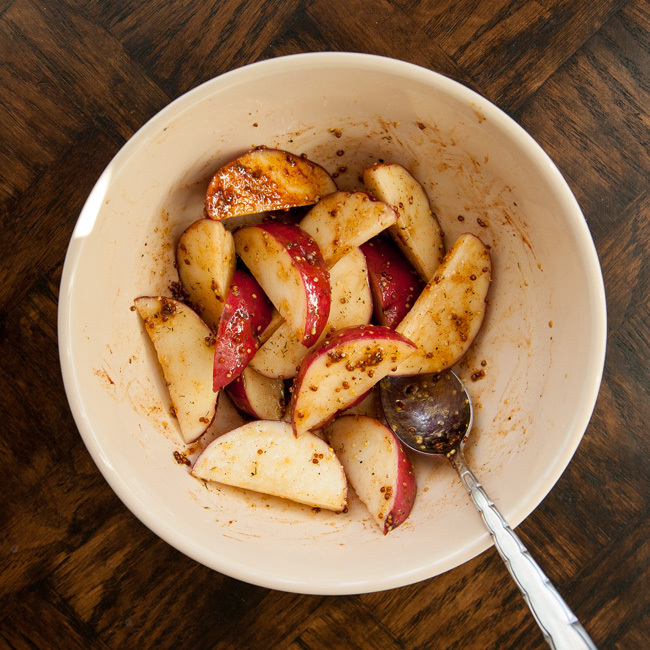 In a medium bowl, toss the potatoes with the olive oil, mustard, maple syrup, hot sauce, paprika, dill, and salt + pepper. Arrange the potatoes in a single layer covering 1/4 of the foil-lined sheet pan, and put it into the oven to begin roasting. 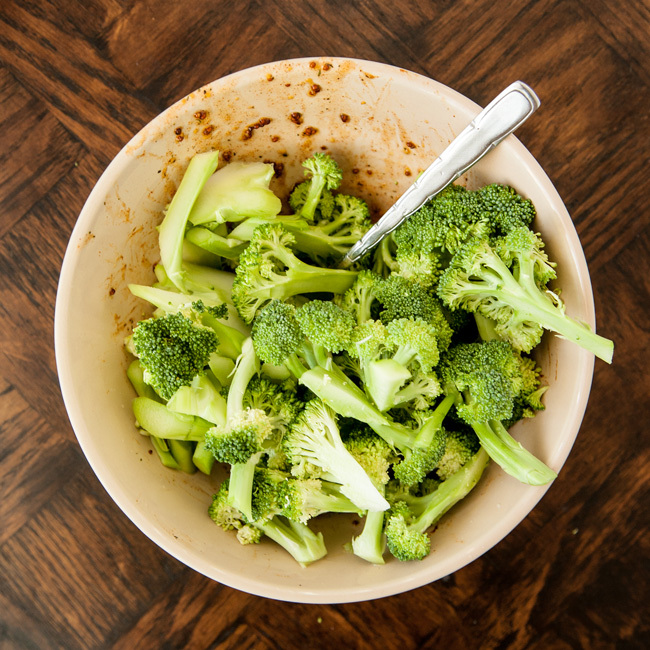 Meanwhile, chop the broccoli and toss it in the same bowl used for the potatoes with olive oil, salt and pepper. After the potatoes have cooked for 20 minutes, remove them from the oven and distribute the broccoli over half of the pan. Coat the chicken breasts with lemon juice, fresh herbs and salt + pepper, then place the chicken on the remaining 1/4 of the sheet pan. Return the pan to the oven and continue to roast for 20 minutes, until the chicken is cooked through and the broccoli is crisp and tender. What a good idea!! I love using the oven to roast a bunch of things at once. Makes cleanup so easy. You bet!! For me, too much cleanup can be a bigger barrier to cooking than the prep itself! Such a smart idea to translate the MyPlate method directly into your food prep method. The visual makes it so clear as to how we should build a healthy meal! Thanks!! It really is all about the visual… once you get into that mindset, it’s easy to apply the same method to anything in your fridge!